Extracted from Nexus Magazine, Volume 7, Number 5 (August-September 2000) or September-October 2000 in the USA only. When the first atomic bomb exploded in New Mexico, the desert sand turned to fused green glass. This fact, according to the magazine Free World, has given certain archaeologists a turn. They have been digging in the ancient Euphrates Valley and have uncovered a layer of agrarian culture 8,000 years old, and a layer of herdsman culture much older, and a still older caveman culture. Recently, they reached another layer.of fused green glass. It is well known that atomic detonations on or above a sandy desert will melt the silicon in the sand and turn the surface of the Earth into a sheet of glass. But if sheets of ancient desert glass can be found in various parts of the world, does it mean that atomic wars were fought in the ancient past or, at the very least, that atomic testing occurred in the dim ages of history? Brad Steiger and Ron Calais report in their book, Mysteries of Time and Space,1 that Albion W. Hart, one of the first engineers to graduate from Massachusetts Institute of Technology, was assigned an engineering project in the interior of Africa. While he and his men were travelling to an almost inaccessible region, they first had to cross a great expanse of desert. Large desert areas strewn with mysterious globules of “glass”–known as tektites–are occasionally discussed in geological literature. These blobs of “hardened glass” (glass is a liquid, in fact) are thought to come from meteorite impacts in most instances, but the evidence shows that in many cases there is no impact crater. If tektites are terrestrial, it means that some process exists by which soil or common rocks can be converted in an instant into homogeneous, water-free, bubble-free glass and be propelled thousands of miles above the atmosphere. If tektites come from the Moon, it seems to follow that there is at least one powerful volcano somewhere on the Moon that has erupted at least as recently as 750,000 years ago. Neither possibility is easy to accept. Yet one of them must be accepted, and I believe it is feasible to pick the more reasonable one by rejecting the more unlikely. The key to solving the tektite problem is an insistence on a physically reasonable hypothesis and a resolute refusal to be impressed by mere numerical coincidences such as the similarity of terrestrial sediments to tektite material. I believe that the lunar volcanism hypothesis is the only one physically possible, and that we have to accept it. If it leads to unexpected but not impossible conclusions, that is precisely its utility. To cite just one example of the utility, the lunar origin of tektites strongly supports the idea that the Moon was formed by fission of the Earth. Tektites are indeed much more like terrestrial rocks than one would expect of a chance assemblage. If tektites come from a lunar magma, then deep inside the Moon there must be material that is very much like the mantle of the Earth–more like the mantle than it is like the shallower parts of the Moon from which the lunar surface basalts have originated. If the Moon was formed by fission of the Earth, the object that became the Moon would have been heated intensely and from the outside, and would have lost most of its original mass and in particular the more volatile elements. The lavas constituting most of the Moon’s present surface were erupted early in the Moon’s history, when its heat was concentrated in the shallow depleted zone quite near the surface. During the recent periods represented by tektite falls, the sources of lunar volcanism have necessarily been much deeper, so that any volcanoes responsible for tektites have drawn on the lunar material that suffered least during the period of ablation and is therefore most like unaltered terrestrial mantle material. Ironically, that would explain why tektites are in some ways more like terrestrial rocks than they are like the rocks of the lunar surface. One of the strangest mysteries of ancient Egypt is that of the great glass sheets that were only discovered in 1932. In December of that year, Patrick Clayton, a surveyor for the Egyptian Geological Survey, was driving among the dunes of the Great Sand Sea near the Saad Plateau in the virtually uninhabited area just north of the southwestern corner of Egypt, when he heard his tyres crunch on something that wasn’t sand. It turned out to be large pieces of marvellously clear, yellow-green glass. In fact, this wasn’t just any ordinary glass, but ultra-pure glass that was an astonishing 98 per cent silica. Clayton wasn’t the first person to come across this field of glass, as various ‘prehistoric’ hunters and nomads had obviously also found the now-famous Libyan Desert Glass (LDG). The glass had been used in the past to make knives and sharp-edged tools as well as other objects. A carved scarab of LDG was even found in Tutankhamen’s tomb, indicating that the glass was sometimes used for jewellery. An article by Giles Wright in the British science magazine New Scientist (July 10, 1999), entitled “The Riddle of the Sands”, says that LDG is the purest natural silica glass ever found. Over a thousand tonnes of it are strewn across hundreds of kilometres of bleak desert. Some of the chunks weigh 26 kilograms, but most LDG exists in smaller, angular pieces–looking like shards left when a giant green bottle was smashed by colossal forces. According to the article, LDG, pure as it is, does contain tiny bubbles, white wisps and inky black swirls. The whitish inclusions consist of refractory minerals such as cristobalite. The ink-like swirls, though, are rich in iridium, which is diagnostic of an extraterrestrial impact such as a meteorite or comet, according to conventional wisdom. The general theory is that the glass was created by the searing, sand-melting impact of a cosmic projectile. However, there are serious problems with this theory, says Wright, and many mysteries concerning this stretch of desert containing the pure glass. The main problem: Where did this immense amount of widely dispersed glass shards come from? There is no evidence of an impact crater of any kind; the surface of the Great Sand Sea shows no sign of a giant crater, and neither do microwave probes made deep into the sand by satellite radar. Furthermore, LDG seems to be too pure to be derived from a messy cosmic collision. Wright mentions that known impact craters, such as the one at Wabar in Saudi Arabia, are littered with bits of iron and other meteorite debris. This is not the case with the Libyan Desert Glass site. What is more, LDG is concentrated in two areas, rather than one. One area is oval-shaped; the other is a circular ring, six kilometres wide and 21 kilometres in diameter. The ring’s wide centre is devoid of the glass. One theory is that there was a soft projectile impact: a meteorite, perhaps 30 metres in diameter, may have detonated about 10 kilometres or so above the Great Sand Sea, the searing blast of hot air melting the sand beneath. Such a craterless impact is thought to have occurred in the 1908 Tunguska event in Siberia–at least as far as mainstream science is concerned. That event, like the pure desert glass, remains a mystery. Another theory has a meteorite glancing off the desert surface, leaving a glassy crust and a shallow crater that was soon filled in. But there are two known areas of LDG. Were there two cosmic projectiles in tandem? Alternatively, is it possible that the vitrified desert is the result of atomic war in the ancient past? Could a Tesla-type beam weapon have melted the desert, perhaps in a test? Pieces of natural silica-glass up to 16 lb in weight occur scattered sparsely in an oval area, measuring 130 km north to south and 53 km from east to west, in the Sand Sea of the Libyan Desert. This remarkable material, which is almost pure (97 per cent silica), relatively light (sp. gin. 2.21), clear and yellowish-green in colour, has the qualities of a gemstone. It was discovered by the Egyptian Survey Expedition under Mr P.A. Clayton in 1932, and was thoroughly investigated by Dr L.J. Spencer, who joined a special expedition of the Survey for this purpose in 1934. The pieces are found in sand-free corridors between north-south dune ridges, about 100 m high and 2-5 km apart. These corridors or “streets” have a rubbly surface, rather like that of a “speedway” track, formed by angular gravel and red loamy weathering debris overlying Nubian sandstone. The pieces of glass lie on this surface or partly embedded in it. Only a few small fragments were found below the surface, and none deeper than about one metre. All the pieces on the surface have been pitted or smoothed by sand-blast. The distribution of the glass is patchy. While undoubtedly natural, the origin of the Libyan silica-glass is uncertain. In its constitution it resembles the tektites of supposed cosmic origin, but these are much smaller. Tektites are usually black, although one variety found in Bohemia and Moravia and known as moldavite is clear deep-green. The Libyan silica-glass has also been compared with the glass formed by the fusion of sand in the heat generated by the fall of a great meteorite; for example, at Wabar in Arabia and at Henbury in central Australia. It would be of considerable interest if the time of origin or arrival of the silica-glass in the Sand Sea could be determined geologically or archaeologically. Its restriction to the surface or top layer of a superficial deposit suggests that it is not of great antiquity from the geological point of view. On the other hand, it has clearly been there since prehistoric times. Some of the flakes were submitted to Egyptologists in Cairo, who regarded them as “late Neolithic or pre-dynastic”. In spite of a careful search by Dr Spencer and the late Mr A. Lucas, no objects of silica-glass could be found in the collections from Tut-Ankh-Amen’s tomb or from any of the other dynastic tombs. No potsherds were encountered in the silica-glass area, but in the neighbourhood of the flakings some “crude spear-points of glass” were found; also some quartzite implements, “quernstones” and ostrich-shell fragments. Oakley is apparently incorrect when he says that LDG was not found in Tutankhamen’s tomb, as according to Wright a piece was found. At any rate, the vitrified areas of the Libyan Desert are yet to be explained. Are they evidence of an ancient war–a war that may have turned North Africa and Arabia into the desert that it is today? There are said to be at least 60 such forts throughout Scotland. Among the most well-known are Tap o’Noth, Dunnideer, Craig Phadraig (near Inverness), Abernathy (near Perth), Dun Lagaidh (in Ross), Cromarty, Arka-Unskel, Eilean na Goar, and Bute-Dunagoil on the Sound of Bute off Arran Island. Another well-known vitrified fort is the Cauadale hill-fort in Argyll, West Scotland. One of the best examples of a vitrified fort is Tap o’Noth, which is near the village of Rhynie in northeastern Scotland. This massive fort from prehistory is on the summit of a mountain of the same name which, being 1,859 feet (560 metres) high, commands an impressive view of the Aberdeenshire countryside. At first glance it seems that the walls are made of a rubble of stones, but on closer look it is apparent that they are made not of dry stones but of melted rocks! What were once individual stones are now black and cindery masses, fused together by heat that must have been so intense that molten rivers of rock once ran down the walls. In 1934, these two designed a test wall that was 12 feet long, six feet wide and six feet high, which was built for them at Plean Colliery in Stirlingshire. They used old fireclay bricks for the faces and pit props as timber, and filled the cavity between the walls with small cubes of basalt rubble. They covered the top with turf and then piled about four tons of scrap timber and brushwood against the walls and set fire to them. Because of a snowstorm in progress, a strong wind fanned the blazing mixture of wood and stone so that the inner core did attain some vitrification of the rock. An important part of Childe’s theory was that it was invaders, not the builders, who were assaulting the forts and then setting fire to the walls with piles of brush and wood; however, it is hard to understand why people would have repeatedly built defences that invaders could destroy with fire, when great ramparts of solid stone would have survived unscathed. Critics of the assault theory point out that in order to generate enough heat by a natural fire, the walls would have to have been specially constructed to create the heat necessary. It seems unreasonable to suggest the builders would specifically create forts to be burned or that such a great effort would be made by invaders to create the kind of fire it would take to vitrify the walls–at least with traditional techniques. speak of Maiden Castle to give an idea of the vast extent of this marvel of prehistoric engineering. It covers an area of 120 acres, with an average width of 1,500 feet and length of 3,000 feet. The inner circumference is about 11Ú2 miles round, and it has been estimated…that it would require 250,000 men to defend it! It is hard, therefore, to believe that this construction was intended to be a defensive position. A great puzzle to archaeologists has always been the multiple and labyrinthine east and west entrances at each end of the enclosure. Originally they may have been built as a way for processional entry by people of the Neolithic era. Later, when warriors of the Iron Age were using the site as a fortress, they probably found them useful as a means of confusing the attacking force trying to gain entry. The fact that so many of these “hill-forts” have two entrances–one north of east and the other south of west–also suggests some form of Sun ceremonial. The forts on the western coast of Scotland are reminiscent of the mysterious clifftop forts in the Aran Islands on the west coast of Ireland. Here we truly have shades of the Atlantis story, with a powerful naval fleet attacking and conquering its neighbours in a terrible war. It has been theorised that the terrible battles of the Atlantis story took place in Wales, Scotland, Ireland and England–however, in the case of the Scottish vitrified forts it looks as if these were the losers of a war, not the victors. And defeat can be seen across the land: the war dykes in Sussex, the vitrified forts of Scotland, the utter collapse and disappearance of the civilisation that built these things. What long-ago Armageddon destroyed ancient Scotland? Vitrified forts in France are discussed in the American Journal of Science (vol. 3, no. 22, 1881, pp. 150-151) in an article entitled “On the Substances Obtained from Some ‘Forts Vitrifiés’ in France”, by M. Daubrée. The author mentions several forts in Brittany and northern France whose granite blocks have been vitrified. He cites the “partially fused granitic rocks from the forts of Château-vieux and of Puy de Gaudy (Creuse), also from the neighbourhood of Saint Brieuc (Côtes-du-Nord)”.10 Daubrée, understandably, could not readily find an explanation for the vitrification. The Hittites were also linked to the world of ancient India. Proto-Indic writing has been found at Hattusas, and scholars now admit that the civilisation of India, as the ancient Indian texts like the Ramayana have said, goes back many millennia. In his 1965 book, The Bible as History,11 German historian Werner Keller cites some of the mysteries concerning the Hittites. According to Keller, the Hittites are first mentioned in the Bible (in Genesis 23) in connection with the biblical patriarch Abraham who acquired from the Hittites a burial place in Hebron for his wife Sarah. Conservative classical scholar Keller is confused by this, because the time period of Abraham was circa 2000-1800 BC, while the Hittites are traditionally said to have appeared in the 16th century BC. Just as Egypt goes back many thousands of years BC and is ultimately connected to Atlantis, so does the ancient Hittite Empire. Like the Egyptians, the Hittites carved massive granite sphinxes, built on a cyclopean scale and worshipped the Sun. The Hittites also used the common motif of a winged disc for their Sun god, just as the Egyptians did. The Hittites were well known in the ancient world because they were the main manufacturers of iron and bronze goods. The Hittites were metallurgists and seafarers. Their winged discs may in fact have been representations of vimanas–flying machines. If one were to believe the great Indian epic of the Mahabharata, fantastic battles were fought in the past with airships, particle beams, chemical warfare and presumably atomic weapons. Just as battles in the 20th century have been fought with incredibly devastating weapons, it may well be that battles in the latter days of Atlantis were fought with highly sophisticated, high-tech weapons. And fire itself, which is to be powerful and quite inextinguishable, is to be prepared as follows. Pitch, sulphur, tow, granulated frankincense, and pine sawdust in sacks you should ignite if you wish to set any of the enemy’s works on fire. L. Sprague de Camp mentions in his book, The Ancient Engineers, 13 that at some point it was found that petroleum, which seeps out of the ground in Iraq and elsewhere, made an ideal base for incendiary mixtures because it could be squirted from syringes of the sort then used in fighting fires. Other substances were added to it, such as sulphur, olive oil, rosin, bitumen, salt and quicklime. Some of these additives may have helped–sulphur at least made a fine stench–but others did not, although it was thought that they did. Salt, for instance, may have been added because the sodium in it gave the flame a bright orange colour. The ancients, supposing that a brighter flame was necessarily a hotter flame, mistakenly believed that salt made the fire burn more fiercely. Such mixtures were put in thin wooden casks and thrown from catapults at hostile ships and at wooden siege engines and defence works. According to de Camp, in AD 673 the architect Kallinikos fled ahead of Arab invaders from Helipolis-Ba’albek to Constantinople. There he revealed to Emperor Constantine IV an improved formula for a liquid incendiary. This could not only be squirted at the foe but could also be used with great effect at sea, because it caught fire when it touched the water and floated, flaming on the waves. De Camp says that Byzantine galleys were armed with a flame-throwing apparatus in the bow, consisting of a tank of this mixture, a pump and a nozzle. With the help of this compound, the Byzantines broke the Arab sieges of AD 674-76 and AD 715-18, and also beat off the Russian attacks of AD 941 and 1043. The incendiary liquid wrought immense havoc; of 800 Arab ships which attacked Constantinople in 716 AD, only a handful returned home. By careful security precautions, the Byzantine Emperors succeeded in keeping the secret of this substance, called “wet fire” or “wild fire”, so dark that it never did become generally known. When asked about it, they blandly replied that an angel had revealed the formula to the first Constantine. We can, therefore, only guess the nature of the mixture. According to one disputed theory, wet fire was petroleum with an admixture of calcium phosphide, which can be made from lime, bones and urine. Perhaps Kallinikos stumbled across this substance in the course of alchemical experiments. Vitrification of brick, rock and sand may have been caused by any number of high-tech means. New Zealand author Robin Collyns suggests in his book, Ancient Astronauts: A Time Reversal?, 14 that there are five methods by which the ancients or “ancient astronauts” might have waged war on various societies on planet Earth. He outlines how these methods are again on the rise in modern society. The five methods are: plasma guns, fusion torches, holes punched in the ozone layer, manipulation of weather processes and the release of immense energy, such as with an atomic blast. As Collyns’s book was published in Britain in 1976, the mentions of holes in the ozone layer and weather warfare seem strangely prophetic. The plasma gun has already been developed experimentally for peaceful purposes: Ukrainian scientists from the Geotechnical Mechanics Institute have experimentally drilled tunnels in iron ore mines by using a plasmatron, i.e., a plasma gas jet which delivers a temperature of 6,000°C. A plasma, in this case, is an electrified gas. Electrified gases are also featured in the Vymaanika-Shaastra, 15 the ancient book from India on vimanas, which cryptically talks of using for fuel the liquid metal mercury, which could be a plasma if electrified. This is still another possible method of warfare used by spacemen, or ancient advanced civilisations on Earth. Perhaps the solar mirrors of antiquity really were fusion torches? The fusion torch is basically a further development of the plasma jet. In 1970 a theory to develop a fusion torch was presented at the New York aerospace science meeting by Drs Bernard J. Eastlund and William C. Cough. The basic idea is to generate a fantastic heat of at least fifty million degrees Celsius which could be contained and controlled. That is, the energy released could be used for many peaceful applications with zero radioactive waste products to avoid contaminating the environment, or zero production of radioactive elements which would be highly dangerous, such as plutonium which is the most deadly substance known to man. Thermonuclear fusion occurs naturally in stellar processes, and unnaturally in man-made H-bomb explosions. The fusion of a deuterium nucleus (a heavy hydrogen isotope which can be easily extracted from sea water) with another deuterium nucleus, or with tritium (another isotope of hydrogen) or with helium, could be used. The actual fusion torch would be an ionised plasma jet which would vaporise anything and everything that the jet was directed at–if…used for harmful purposes–while for peaceful applications, one use of the torch could be to reclaim basic elements from junk metals. University of Texas scientists announced in 1974 that they had actually developed the first experimental fusion torch which gave an incredible heat output of ninety-three degrees Celsius. This is five times the previous hottest temperature for a contained gas and is twice the minimum heat needed for fusion, but it was held only for one fifty-millionth of a second instead of the one full second which would be required. It is curious to note here that Dr Bernard Eastlund is the patent holder of another unusual device–one that is associated with the High-frequency Active Auroral Research Program (HAARP), based at Gakona, Alaska. HAARP is allegedly linked to weather manipulation–one of the ways in which Collyns thinks the ancients waged warfare. Soviet scientists have discussed and proposed at the United Nations a ban on developing new warfare ideas such as creating holes or “windows” in the ozone layer to bombard specific areas of the Earth with increased natural ultra-violet radiation, which would kill all life-forms and turn the land into barren desert. Other ideas discussed at the meeting were the use of “infrasound” to demolish ships by creating acoustic fields on the sea, and hurling a huge chunk of rock into the sea with a cheap atomic device. The resultant tidal wave could demolish the coastal fringe of a country. Other tidal waves could be created by detonating nuclear devices at the frozen poles. Controlled floods, hurricanes, earthquakes and droughts directed towards specific targets and cities are other possibilities. Finally, although not a new method of warfare, incendiary weapons are now being developed to the point where “chemical fireballs” will be produced which radiated thermal energy similar to that of an atomic bomb. Vitrified Ruins in California’s Death Valley: Evidence of Atomic War? In Secrets of the Lost Races, 16 Rene Noorbergen discusses the evidence for a cataclysmic war in the remote past that included the use of airships and weapons that vitrified stone cities. These vitrified ruins in Death Valley sound fascinating–but do they really exist? 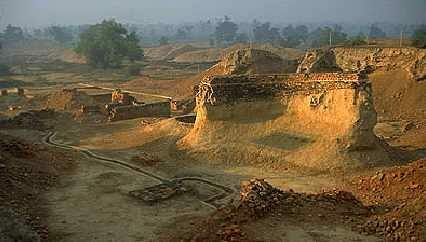 There certainly is evidence of ancient civilisations in the area. In Titus Canyon, petroglyphs and inscriptions have been scratched into the walls by unknown prehistoric hands. Some experts think the graffiti might have been made by people who lived here long before the Indians we know of, because extant Indians know nothing of the glyphs and, indeed, regard them with superstitious awe.